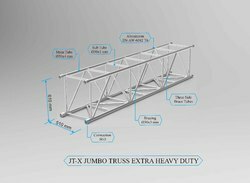 JT-X Truss is constructed of main tube (50mm x 4mm) and diagonals (30mm x 3mm) with uses the SG-3 connections system. Hence it can be used upto 80 ft free span with high load bearing capacity.JT-X has 3 side diagonal webbing and can hold the weight upto greater strength. The supported tower system (SST-38) along with JT-X allows you to save space while transporting due to standard size variation we considered with the smart placing of the hinges and connection system it reduces the risk of hand and finger injuries. Assembly of truss is easy. FACTSTolerance free conical connector system.Super-size conical connection for maximum rigidity3 Side Webbing.Can be used upto 80 ft.High stability aluminum alloy.Extreme load bearing capacity.Low dead weight.High wear resistance.4mm wall thickness of 50mm main tube. This is a dj console for small event purpose. If you need any other type of console like designer console, big console, attractive console so please contact us first because we have our own designers for design a perfect console for you as per your requirement and we have our fully In house production. 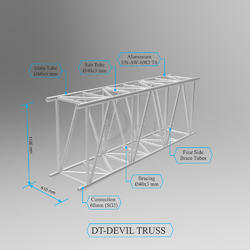 DT Truss is constructed of main tube (60mm x 6mm) and diagonals (40mm x 3mm) with uses the SG-3 connections system. Hence it can be used upto 140 ft free span with high load bearing capacity. DT has 4 side diagonal webbing and can hold the weight upto greater strength. The supported tower system (SST-48) along with DT allows you to save space while transporting due to standard size variation we considered with the smart placing of the hinges and connection system it reduces the risk of hand and finger injuries. Assembly of truss is easy. 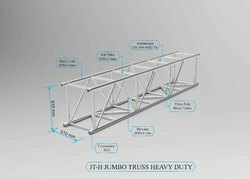 JT-H Truss is constructed of main tube (50mm x 3mm) and diagonals (30mm x3mm) with uses the SG-2 connections system. Hence it can be used upto 60 ft free span with high load bearing capacity.JT-H has 3 side diagonal webbing and can hold the weight upto greater strength. The supported tower system (SST-38) along with JT-H allows you to save space while transporting due to standard size variation we considered with the smart placing of the hinges and connection system it reduces the risk of hand and finger injuries. Assembly of truss is easy. FACTSTolerance free conical connector system.Super-size conical connection for maximum rigidity3 Side Webbing.Can be used upto 60 ft.High stability aluminum alloy.High load bearing capacity.Low dead weight.High wear resistance.3mm wall thickness of 50mm main tube. 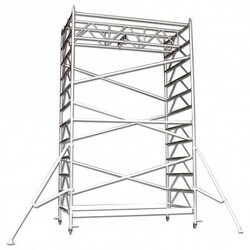 MT Truss is constructed of main tube (50mm x 4mm) and diagonals (30mm x3mm) with uses the SG-3 connections system. 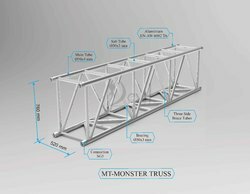 Hence it can be used upto 100 ft free span with high load bearing capacity.MT has 3 side diagonal webbing and can hold the weight upto greater strength. The supported tower system (SST-40) along with MT allows you to save space while transporting due to standard size variation we considered with the smart placing of the hinges and connection system it reduces the risk of hand and finger injuries. Assembly of truss is easy. FACTSTolerance free conical connector system.Super-size conical connection for maximum rigidity3 Side Webbing.Can be used upto 100 ft.High stability aluminum alloy.High load bearing capacity.Low dead weight.High wear resistance.4mm wall thickness of 50mm main tube. 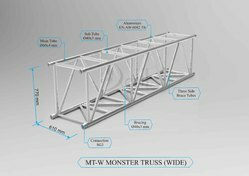 MT-W Truss is constructed of main tube (60mm x 4mm) and diagonals (40mm x 3mm) with uses the SG-3 connections system. Hence it can be used upto 120 ft free span with high load bearing capacity.MT-W has 3 side diagonal webbing and can hold the weight upto greater strength. The supported tower system (SST-45) along with MT-W allows you to save space while transporting due to standard size variation we considered with the smart placing of the hinges and connection system it reduces the risk of hand and finger injuries. Assembly of truss is easy. FACTSTolerance free conical connector system.Super-size conical connection for maximum rigidity3 Side Webbing.Can be used upto 120 ft.High stability aluminum alloy.Extreme load bearing capacity.Low dead weight.High wear resistance.4mm wall thickness of 60mm main tube. The SST-38 Tower is based on 380mm x 380mm vertical beam that allows the safe, quick lifting of regularly loaded horizontal JT-H & JT-X Truss to their service height. In terms of static, the SST-38 Tower is designed for a high flexural- and pressure strain. It is provided with aluminum (6082-T6). Top frame and sleeve block. Base is made of steel to provided maximum ground traction needed due to it’s weights and supports. 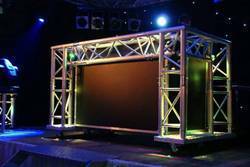 Dual height adjusted on each ground support make it very rigid structure to be used indoor or outdoor. FACTSTolerance free conical connector system.Steel base equipped with high quality Nylon wheelsMulti-functional Top Part for use with manual and motorized hoists4 Side Webbing.Short & Long outriggers available. High stability aluminum alloy.High wear resistance.3 mm wall thickness of 50 mm main tube. Top Plate & Sleeve BlocksMade with aluminum alloy (EN-AW-6082-T6) with hook monitoring on sleeve block make it easy for use and reduce the uses of straps additional attachment can be provided for electric chain hoist with precise manufacturing the connection is error free and can be fitted easy to and fro. Top plate can be provided with steel pulleys as well as nylon pulleys as per requirement. Hinge setA strong, safe and cost effective solution to erect the SST-38Tower. The hinge sets are 100mm long. Those half connectorswith a hinge fork allow a very high vertical load.4 Hinge sets (2 left and 2 right) are required per tower. Base sectionBase is made of steel rectangular section(96x48mm) with 3.2mm thickness fitted with Nylon wheels which ensure loads on various ground conditions with dual height adjuster on outriggers allow it to be fitted without interference half-male SG2 connections allow the tower to be fitted with less efforts more precise. Outriggers & AccessoriesThe outriggers is made with steel rectangular section (80x40mm) available in short outriggers and long outriggers in combination with stabilizer bars and it depends on the purpose when which to use. We are using dual height adjuster for long outriggers. At outdoor with maximum height the long outriggers is recommended which is indoor the short outriggers can be used when height is below 20ft. Next to the standard parts Devil Truss supply additional accessories, which can be demanded for different usage for stability. The SST-45 Tower is based on 450mm x 450mm vertical beam that allows the safe, quick lifting of regularly loaded horizontal MT-W Truss to their service height. In terms of static, the SST-45 Tower is designed for a high flexural- and pressure strain. It is provided with aluminum (EN-AW-6082-T6). Top frame and sleeve block. Base is made of steel to provided maximum ground traction needed due to it’s weights and supports.Dual height adjusted on each ground support make it very rigid structure to be used indoor or outdoor. FACTSTolerance free conical connector system.Build for extreme heights and loadsSteel base equipped with high quality Nylon wheelsMulti-functional Top Part for use with manual and motorized hoists4 Side Webbing.High stability aluminum alloy.High wear resistance.4 mm wall thickness of 50 mm main tube. Top Plate & Sleeve BlocksMade with aluminum alloy (EN-AW-6082-T6) with hook monitoring on sleeve block make it easy for use and reduce the uses of straps additional attachment can be provided for electric chain hoist with precise manufacturing the connection is error free and can be fitted easy to and fro.Top plate can be provided with steel pulleys as well as nylon pulleys as per requirement. Hinge setA strong, safe and cost effective solution to erect the SST-45Tower. The hinge sets are 100 mm long. Those half connectorswith a hinge fork allow a very high vertical load.4 Hinge sets (2 left and 2 right) are required per tower. Base sectionBase is made of steel rectangular section(122x61mm) with 4.5mm thickness fitted with Nylon wheels which ensure loads on various ground conditions with dual height adjuster on outriggers allow it to be fitted without interference half-male Sg2 connections allow the tower to be fitted with less efforts more precise. Outriggers & AccessoriesThe outriggers is made with steel rectangular section (96x48mm) available in long outriggers in combination with stabilizer bars. We are using dual height adjuster for long outriggers. Next to the standard parts Devil Truss supply additional accessories, which can be demanded for different usage for stability. Its Installations is simple, easy to use, credibility and economy cost. It usually used in big outdoor shows and events & You can hang LED, lighting, tent, sound, led screen and banner on the truss, suitable for displays, exhibition, show, concert, performance, events, etc., finish in a snap, very strong, convenient for set up and transportation. Crowd barriers are used when audiences and spectators need to be held at a distance, but sometimes you need to have an easy access. This is the case with this variant provided with a gate. The gate access barrier can be used as regular barrier but also as a gateway enabling crew to walk through. These barriers ensure safety, high quality and ease of use with ergonomics and easy handling. They fold flat after use and can be stacked on dollies for easy transport and storage. Looking for Aluminium Truss ?